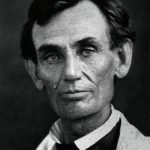 In Mr. Lincoln’s famous address, which many credit with earning him the presidency, Mr. Lincoln argued against the spread of slavery to the Western states. 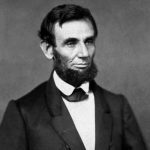 The speech is the subject of a new book by Harold Holzer, Lincoln at Cooper Union: The Speech That Made Abraham Lincoln President, published by Simon and Schuster. Prior to Waterston’s speech, Mr. Holzer described the culture that produced the speech, Lincoln’s presidential campaign, and the speech’s impact. Mr. Holzer introduced Sam Waterston’s presentation. Actor Sam Waterston delivered Abraham Lincoln’s Cooper Union Address in the Great Hall of Cooper Union for the Advancement of Science and Art, where it was originally delivered on February 27, 1860. This reenactment was made on May 05, 2004. OLDERLincoln in 1858, the year of his debates with Stephen Douglas over slavery.